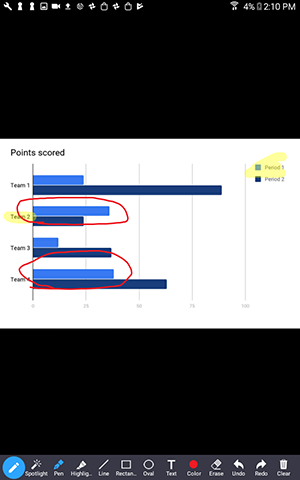 The whiteboard feature will allow you to share a whiteboard that you and other participants (if allowed) can annotate on. Read more about annotating as a viewer of a shared screen or whiteboard. Click the Share Screen button located in your meeting tool bar. The annotation tools will appear automatically, but you can press the Whiteboard option in the meeting controls to show and hide them. Mouse: Deactivate annotation control and switch back to your mouse pointer. Select: Select, move, or resize your annotations. Draw: Insert lines, arrows, and shapes. 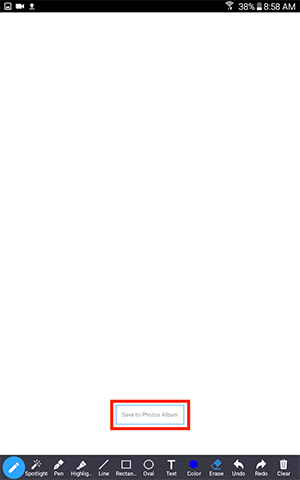 Stamp: Insert predefined icons like a check mark or star. Spotlight/Arrow: Turn your cursor into a spotlight or arrow. Eraser: Click and drag to erase parts of your annotation. Format: Change the formatting options of the annotation tools. Undo: Undo your latest annotation. Redo: Redo your latest annotation that you undid. Save: Save all annotations on the screen as a screenshot. The screenshot is saved to the local recording location. Use the page controls in the bottom-right corner of the whiteboard to create new pages and switch between pages. Note: Only the participant or host that started sharing the whiteboard has access to create and switch pages. 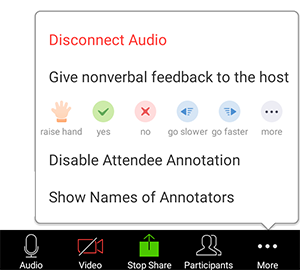 Allow/Disable participants annotation: Allow or prevent the participants from annotating on your shared screen. Show/Hide Names of Annotators: Show or hide the participants' name when they are annotating. If set to show, the participant's name will briefly display beside their annotation. When you are done, click Stop Share. If you have simultaneous screen sharing on, multiple participants will be able to share a whiteboard at once. However, to see two whiteboards at once, or your own whiteboard and another participant's, you will need to have dual monitors enabled. Tap Share in the meeting controls. Tap the pen icon to open the annotation tools. Use the annotation tools to draw on your whiteboard. 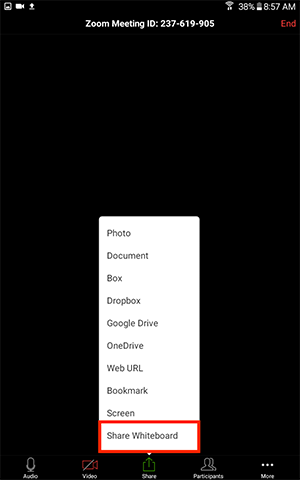 Press on the screen using the select or eraser tool until the Save to Photos Album option appears. Tap Save to Photos Album. When you are done, tap the pen icon to close the annotation tools and tap Stop Share. Show/Hide Names of Annotators: Show or hide the participants' name when they are annotating on a screen share. If set to show, the participant's name will briefly display beside their annotation. Note: Whiteboard is currently available for iPad only. If you are on an iPhone, you will not see the Whiteboard option. Tap Share Content in the meeting controls. The annotation tools should appear automatically, but you can tap the pen tool to show and hide them. When you are done, tap Stop Share.